The 2014 World Cup may be but a distant dream, but for those of you already thinking about the new football season, now is the time to hunt down the right tipster expert to help you make money betting. South America has been up till now an untapped market for making profit football betting, with very few tipsters able to take advantage of the bookies lack of knowledge in these leagues. That is until now as we have an exclusive review of one particular South American football expert with a tremendous record over the past 3 years. During this time he has made 592.1% bank growth – a near 6 time increase on your starting capital. This review tackles the intriguing ‘Set & Forget’ method put forward by one tipster, where you can place a series of Over 2.5 goals bets both before a game and in-play on Betfair. Over the past 12 months proofing, this approach has made a 12.3% Return on Investment from 265 bets and achieved a 56% strike-rate of success. SBC members can also join for as little as £7 per month – a saving of £13 per month. Similarly to the South American expert above, this tipster also takes advantage of his knowledge in a niche betting market – the Croatian Leagues. His debut season was highly impressive with a 19.5% ROI and 73% betting bank growth, with all bets initially proofed for free via the SBC Forum. The Croatian leagues have just started again for the new season and he is also off to a flyer – winning his first 5 tipsand showcasing just how the bookies are vulnerable to a true football expert. Now a paid subscription service – SBC members can obtain an exclusive discount on joining. Last but certainly not least we have a full review of a fantastic football ratings system with a tremendous record to date. With a record dating all the way back to 2006 and over 12,000 bets to work from, this method has certainly got tongues wagging and its easy to see why. Last season our recommended approach would have more than doubled your money with 106% growth! Easy to follow and easy to get the advised prices – we think this tipster will be very popular this season. SBC members can also enjoy a £30 discount on the cost of joining. If these 4 reviews grab your interest then you can read about them in the latest SBC magazine the instant you join our service at the Smart Betting Club. That’s not all though because as an SBC member you can also gain access to our huge 8-year back catalogue full of tipster reviews, expert interviews and guides, betting systems and profitable betting advice. 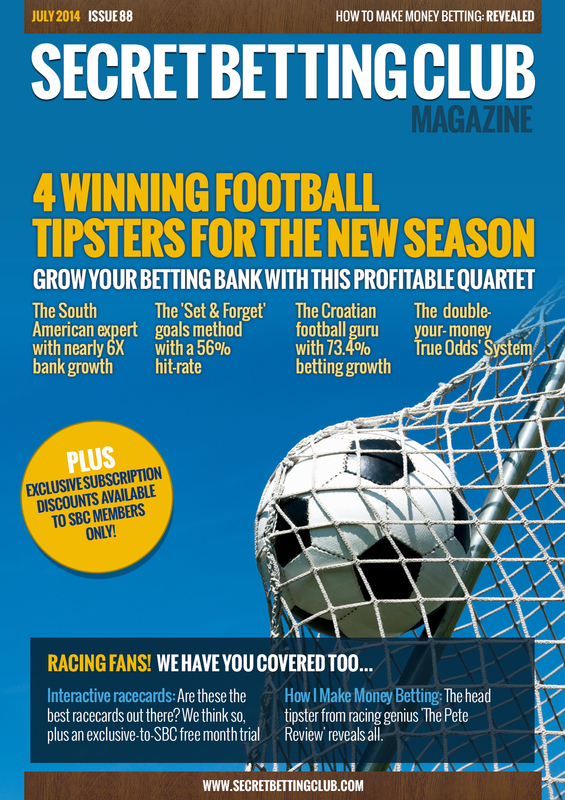 Out Now: Latest SBC Magazine & 4 Top Tipsters Reviewed! The very latest Smart Betting Club Magazine has just been released and once again its jam-packed full of tipster reviews, analysis and interviews to help you make money betting. Featuring independent reviews on 4 uniquely profitable football tipsters, a look at the best interactive race cards out there PLUS how you can save big-time on all the above, its an absolute must-read! The South American expert with just shy of 6X betting bank growth in 2 seasons. The ‘Set & Forget’ over 2.5 goals method with a 56% strike-rate. The Croatian football guru with 73.4% betting growth in debut season. Check out the full SBC lowdown on all 4 tipsters PLUS How you can secure exclusive discounts on 2), 3) & 4) as an SBC member! Interactive Race Cards: Read our in-depth review of the best value race cards out there and exclusive extended 1 month trial for SBC readers. Top Racing Tipster Speaks Out: High-flying racing expert Pete Donohoe discusses how he makes money betting. Celebrate our new website launch & win an iPad mini! It’s an exciting time for us here at SBC Towers as we have finally unveiled the new-look Smart Betting Club website. Want not just the Betting Magazines & Tipster Profit Reports but also our Ultimate Betting Package, Practical Punter Reports & Tipster Discounts? Then our complete Gold membership package will be right up your street! To help celebrate the launch of our new website we are offering anyone that signs-up for either a Silver or Gold membership entry into a special prize draw to win a brand new iPad Mini! All you need to do to be in with a chance of winning the iPad Mini is to simply sign-up for either a Silver or Gold SBC membership between now and next Friday the 25th July. If you do so, then you will be entered into the special draw to be in with a chance of scooping the prize! Sign-up today for a Silver or Gold SBC membership! 1. Why The Bookie Is Not Your Friend! Bookmakers love to pretend to be on your side, although the reality is often quite different…Here is why plus how Ray Winstone’s Bet365 tips bagged just 1 win in 25! Read some exclusive excerpts from our interview with a bookmaker insider who spills the beans on how we can beat the ‘enemy’. 8 essential tips on how to make a profit football betting from some of the top tipping experts out there. 4. Each-Way Or Win Only… Whats The Best Way To Bet? Help solving the eternal problem of whether its better to place your bets win only or each way. Includes one example tipster who improved their profits by 72% after choosing the right method. How to compare tipsters the easy way, even if they tip bets at completely different odds, strike-rate or quantity. Our get ‘betting-fit’ guide for the start of the New Year and 5 top tips on how to topple the bookmaker in 2014. Exactly why were the first few months of the 2013/14 season so out of sync? Plus possibly the worlds worst system revealed! 8. Why This Free Tipster Demands Your Attention! It’s a myth that when it comes to finding winning betting tips you need to spend a fortune. Here is one easy way to find top free tipsters. A simple strategy that can help you get significantly better odds on your football bets in a couple of under-used betting markets.